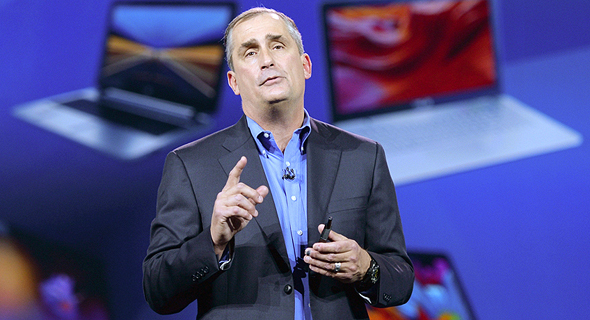 Intel CEO Brian Krzanich has arrived in Israel for a two-day visit. At a Tuesday event, Mr. Krzanich said he intends to spend Wednesday driving around Israel in an autonomous vehicle along with Mobileye co-founder and CEO Amnon Shashua, one person who attended the event said in an interview with Calcalist Wednesday. Intel acquired the Jerusalem-based automotive chipmaker Mobileye in 2017 for $15.3 billion, putting the dominant Israeli autonomous driving company at the head of its automated driving group. Mr. Krzanich was the driving force behind the deal, according to an August interview with Intel Capital’s President Wendell Brooks, the man who brokered the acquisition. Mr. Shashua stated several times that Mobileye expects serial production of autonomous cars to start by 2021. A report released recently by Chicago-headquartered market research and consulting company Navigant Research ranked Intel sixth out of 19 on the list of industry leaders in automated driving systems, based on criteria such as go-to-market strategy, production strategy and technology. The research company cited a partnership between Intel and Mobileye with BMW as a major factor influencing the company’s rank. Tesla, once among the leaders of the pack, fell to last place on Navigant’s ranking. Tesla’s break up with Mobileye in 2016, following a fatal test car crash that led both companies to exchange blame, was cited by the research company as an event that led to the company’s slide. General Motors, which has an Israeli research center employing around 300 people, was ranked first by Navigant, and Google’s Waymo is in second. A partnership between Daimler AG and auto part maker Bosch on autonomous driving systems was ranked third by Navigant. In 2017, Daimler inaugurated an innovation center in Israel. Intel and Mobileye are currently expanding Mobileye's Jerusalem campus with the intention of turning it into Intel's global autonomous vehicle center. The company employs around 1,000 people in Israel, which have joined Intel's 11,000 Israeli employees last year.